“Modulatory Effects of Deep Brain Stimulation on Distributed Brain Networks“. In case you are working on topics that combine brain stimulation with connectomics, would like to write a review or short report in that domain, please consider submitting to this issue – deadline is july 2019. The field of deep brain stimulation (DBS) is currently experiencing a paradigm-shift, from studying impacts on local brain tissue toward the analysis of modulatory effects on distributed brain networks. With the rise of modern non-invasive neuroimaging methods, this local-to-global shift bears promising potential to better-understand brain disorders, brain function, and to translate novel concepts into clinical practice. Already, network-based targets that may guide surgical planning and DBS programming are being introduced and prospectively validated with the potential to revolutionize the field. 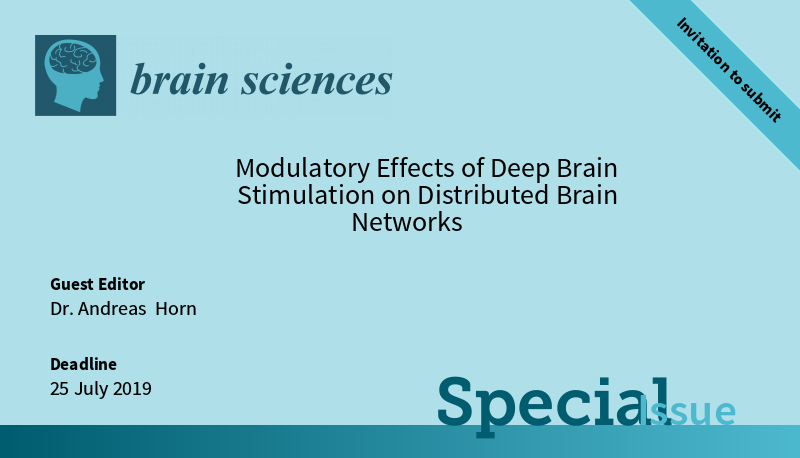 In this Special Issue, we will discuss the indications, potentials, efficacy and validation of network-based brain stimulation concepts with a special focus on DBS. These include the combination of DBS imaging with resting-state functional magnetic resonance imaging, diffusion-weighted imaging based tractography and electrophysiological measures such as electroencephalography, magnetoencephalography and local field potential recordings. http://www.netstim.berlin/wp-content/uploads/2018/07/banner-DBS.png 458 800 andreashorn http://andreas-horn.de/wp-content/uploads/2018/12/lablogo_netstim_berlin_backslash-1030x185.png andreashorn2018-07-20 12:15:372018-07-27 07:34:27Brain Sciences Special Issue "Modulatory Effects of Deep Brain Stimulation on Distributed Brain Networks"